Photograph and text 2009 by Jacqueline Banerjee. Mystery still surrounds the fate of Franklin and his men, and Bellot himself perished while helping two crew members adrift on an ice floe. The young French naval officer was greatly admired in England for being "at all times foremost in the offer of his services for any difficult or dangerous undertaking" ("Lieut. Bellot" 641), and the memorial here was set up by public subscription. 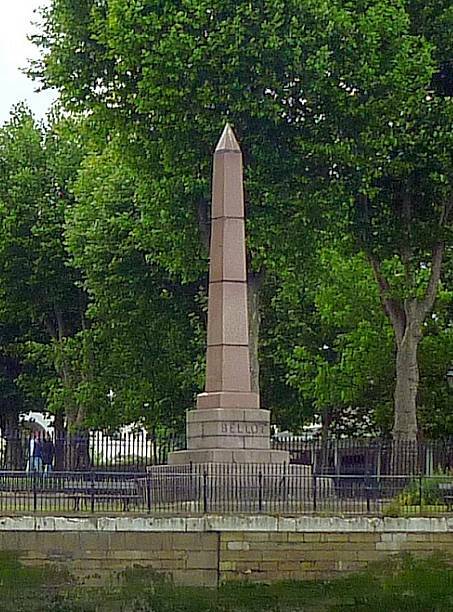 Philip Hardwick, architect of the warehouses at St Katharine Docks and surveyor to Greenwich Hospital since 1848, designed the memorial, giving it the currently popular form of an Egyptian obelisk (see Curl 266). The monument is between 27' and 28' high ("Bellot Memorial"); for a much taller obelisk, see the earlier Wellington Monument in Dublin. "Bellot Memorial" (Public Monuments & Sculpture Association site). Viewed 7 August 2009. Curl, James Stevens. The Egyptian Revival: Ancient Egypt as the Inspiration for Design Motifs in the West. London: Routledge, 2005. "Lieut. Bellot" (Obituary). The Gentleman's Magazine and Historical Review. 21 August 1852: 640-42. Available here.